Hey I was looking through the celebrities and stumbled upon Dame Katrana Prestor. For her staff in your Item Set you used Bâton de sylvegarde. But to get the exact same copy of the staff that Dame Katrana Prestor is wearing, you can go to Profondeurs de Rochenoire and kill Empereur Dagran Thaurissan, to get Bâton-guide de sagesse. Is there a set for Lady Sylvanas Windrunner? Hey can any1 help please I need shoulders, pant, gloves and a belt to go with this http://www.wowhead.com/item=21663#comments. I need some pants that are just like little knickers so you can see my thighs. Confesseur d'argent Paletress - Item Set - Argent Confessor Paletress, a human priest, is the second boss in Trial of the Champion. She looks like a "good" version of Grande inquisitrice Blanchetête. Personally I wouldn't mind having the two of them as my conscience, arguing on my shoulders about what I should or shouldn't do. could someone help me, i want the same chest and shoulders of Marshal Isildor (Maréchal Isildor) . (or a look alike). 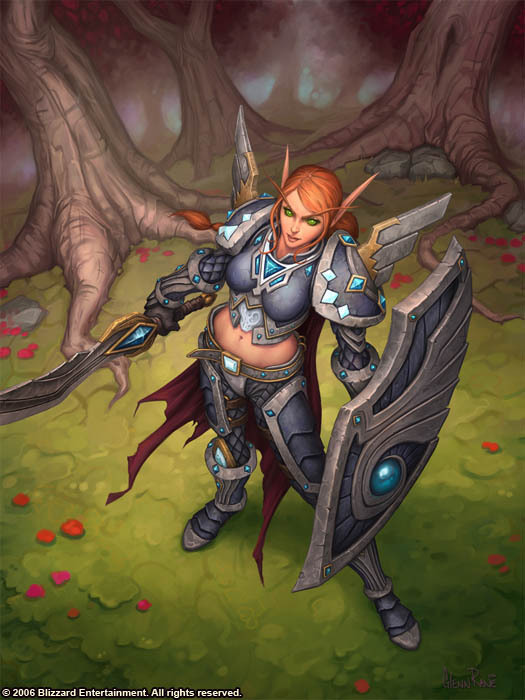 Is there something that looks similar to the armor of Lady Sylvanas Windrunner? I know she and Alexstraza have a unique skin that they share, but there should be something similar at least, shouldn't it? I am looking for a belt to the lord darion morgraine set any help? I think you Should add Alleria Windrunner. She has not appeared in game, but they show her with armor. Or Llane Wrynn (although, he is dead.) Check the Chess event version of him. BLACKHAND. See if you can find Blackhand Armor. oh.... and, I wish we had varian armor. Kind of like Tyrande's armor here, there is a Varian that does not look like what Varian does as of today. He looks like a ordinary human mage, with a golden scepter. http://www.wowhead.com/transmog-set=1055#modelviewer:4+0 without the shoulders or Helm. Spaulders of Dementia For Shoulders. Best fitting sword is out of commission. Nice guide, but I think you should sort it in 'cloth, leather, mail, plate'. Now I had to click every set to discover wether my rogue could wear it! Cool guide! I really enjoy transmogging my max level characters & lowbies that don't share their heirlooms with anybody else... I usually just like to start with a really good looking weapon or shoulders/head armor and build from there. I am colorblind & it is always tough for me to make sure that sets that appear to match to me actually match to people with normal color vision... like if I am going for a fiery red/orange/yellow look, I might not notice that one of the "yellow" items I chose is actually light green or something... a transmog that might look perfect to me, could look like total crap and I'd have no real way of knowing. Does anybody know if there are any Add-Ons/in-game data/wowhead info that would give the color data for specific items? what items are similar to Alexstrasza's outfit that she wears in the wyrmrest temple? link them too please? Is there a robe that looks like the one from " High Priestess Azil " ? ( Grande prêtresse Azil ) I can't find one and there was no suggestion in the comments. How about the outfit you get from Blingtron 4000? I've been trying to track it on Blingtron's page, and haven't quite managed to pin it down. It's this guide mainly for alliance NPC' s?